The devastated animals were rescued from a property in Leland, North Carolina where their owners left them as they fled the hurricane. It’s clear the owners hadn’t given a second thought of how the animals would fare in the violent storm. 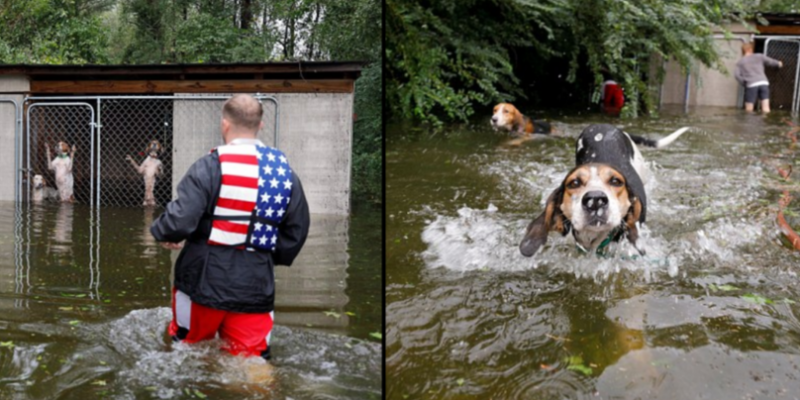 Journalist Marcus DiPaola reported on Twitter saying: “‘Rescued six dogs in Leland, NC, after the owner LEFT THEM locked in an outdoor cage that filled with flood water that was rapidly rising. In the emotional video, which has already racked up more than 1.3 million views, the dogs can be seen and heard whimpering as they see volunteer rescuer Ryan Nichols of Longview, Texas wade in the knee-deep water towards the creatures. In North Carolina the flood waters reached four feet in height on Sunday, while continuing to rise steadily. According to accuweather.com, the flooding near the Yadkin river in Jonesville is forecast to crest at 26.6 feet. Tragically, the hurricane has left fatalities as 12 people have died in North Carolina. This is not the only animal rescue to happen during the devastation of Hurricane Florence. On Sunday a reporter stopped mid-broadcast to help rescue a dog. WTVD’s Julie Wilson was streaming a report on Facebook Live in New Bern while speaking to those affected by the flooding and working alongside boat crews as they attempted to rescue local residents. It’s during this shoot that Julie noticed a woman named Tasha trying to save a Rottweiler from the knee-deep water. “Do you think that is safe?” asked the reporter. “It’s my daughter’s therapy dog. I have no choice,” replied Tasha. ABC News reported that as the woman went to recover her dog, Julie continued to discuss her surroundings. Once she saw Tasha was struggling, she leapt into action, handing her phone over so she could jump in herself and help rescue the injured dog called Daisy. It seems not all heroes wear capes.